TRP Bloggers: The heat is on! When you watch a show, it’s very rare that you actually think about what is happening backstage. Whilst everything on stage is running like a well-oiled machine, appearing effortless and seamless, there is a storm of activity buzzing away behind the scenes. There is a lot of work that goes into putting on a show, both on stage and off, and when a show heads out on tour, that work load only increases. 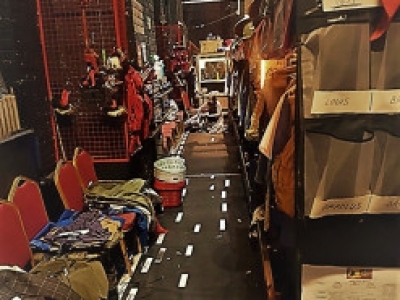 We were invited backstage at the Bristol Hippodrome to see exactly what work has to be done to put on a huge scale touring production as the theatre plays host to the UK Tour of Miss Saigon. This wonderfully stunning yet heart-breaking musical ran to rave reviews in the west end and in New York, and this touring version of the Broadway show has been stunning audiences across the UK as it comes flying into the Southwest with this Bristol run. And it will soon be landing in Plymouth where I am sure that more audiences will fall in love with this story of war, dedication, romance and never-ending belief. As we were lead through the stage door and down through the wings, I was surprised to see just how little space there was to store everything needed for such a huge show. Set pieces such as the American Dream car were suspended above the wings to save space and shelves of props lined the walls. It’s hard to believe the amount of organisation required to set up a show. A huge team of crew members work together to ensure that the props are all in the right place and make sure that all costumes are set up depending on what cast members are on for that show. It’s only when you see the set and the props so close up that you realise the attention to detail. Some of the details are so small that it’s near on impossible to notice them from the audience, but it’s all done to create an incredibly believable world. Theatre is about escapism and all of these tiny details aid this escapism. The world in which a show is set has got to be believable enough to allow the audience to invest emotionally in everything that happens within in, and this attention to detail is all part of that. It also helps the cast get more into character. 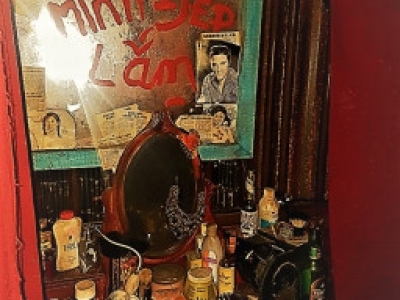 Some of these tiny details included a mosaic of magazine cut outs that covered the Dreamland bar and the collection of trinkets and photographs that cover Kim’s dressing table. In this photograph, you can see this desk, covered in images of American culture to illustrate the characters dreams of a better life in The States. The writing in lipstick on the mirror reads ‘You are beautiful’ in Vietnamese. For a show of this scale, it is no surprise that there are countless costumes stored backstage. All of these costumes have to be carefully organised to ensure that they are ready to be used in the many quick changes. The male quick change area run behind the back of the stage whilst the girls quick change laid in a narrow dressing room off to one side. Just like the props, the costumes are incredibly detailed. Each of the girl’s costumes for The American Dream has over 1.5kg of decoration on it and the GI’s coats are all authentic. In fact, the coat worn by Ashley Gilmour as Chris has been worn in combat. Before every show, the dressers have to make sure that all of the costumes are ready as the cast can change for each performance with different people playing different roles. It is amazing how they can manage to fit so much in with so many people quickly moving around the area. It is organisation to the highest degree. When it comes to Miss Saigon, one question that often comes up is how do the very young children sharing the role of Tam cope with the hard hitting themes of the show. When the children are in rehearsal of the show, it is all treated like one big game and it is made very clear that it is all pretend. Throughout the show, the children are protected from the darker moments, even when they are on stage during them. They always have an adult close to them and the children never see the violent moments. 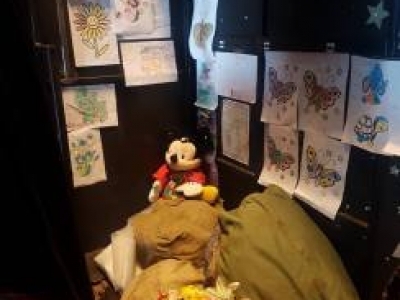 Whilst they are not on stage, the children have a little area in one of the set pieces where they can sit and play whilst waiting for their scenes. The walls of this house set are covered in colouring pages and scattered with toys, a clear sign that the children are more than happy being there. Everything about this show is on a huge scale. It takes 18 huge lorries to transport all of the sets and props from one theatre to another, and a huge team to disassemble and reassemble the show at each location. The famous helicopter travels in one piece in a curtain sided truck. You never think about what is going on behind the scenes but having seen it all for myself, I now really appreciate all the work that goes into creating the theatre I love. 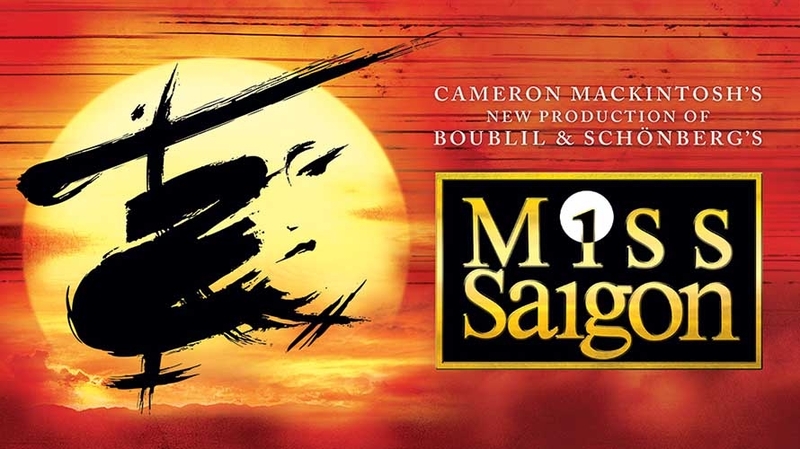 You can see Miss Saigon and see this beautiful emotional musical for yourself at Theatre Royal Plymouth when it comes flying into town soon, starting July 4th and running until August 4th. You will be swept away in the magic, romance and heartbreak of it all.